Canine lungworm is a deadly parasite which is becoming increasingly prevalent in parts of the UK. Unfortunately, this parasite is now common in Weybridge, Walton and the surrounding areas as we have the right climate and a prolific urban fox population (who act as carriers of the parasite). The parasite is passed out in the faeces of infected dogs and foxes and enters slugs, snails and frogs. 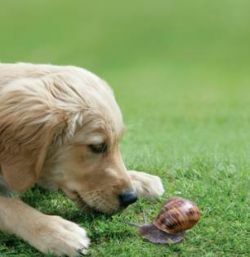 Dogs are then infected when they eat the slug, snail or frog, either deliberately or accidentally. The swallowed larvae burrow out of the dog’s intestine and spread through the body, causing damage as they travel and mature. The adult worms live in the large blood vessel above the heart and the female produces eggs which travel in the bloodstream to the lungs, where they are coughed up, swallowed and pass out in the faeces to begin another cycle of infection. Lungworm infection can be fatal. The clinical signs of infection vary between dogs and depend on which tissue has been damaged. A chronic cough is often observed but other signs include weakness, vomiting and neurological signs. The lungworm also produces chemicals which interfere with the dog’s blood clotting. This means even minor cuts bleed profusely and the blood loss following major cuts or surgery can be fatal. 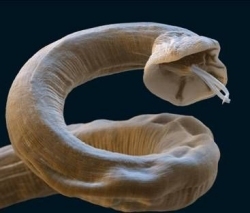 This is a picture of the adult lungworm Angiostsrongylus vasorum. Luckily, if diagnosed early the parasite can be eradicated and the dog make a full recovery. However, it is preferable to prevent infestation in the first place. Attempting to eliminate all snail, slugs, frogs and foxes from your dog’s environment is futile. The best method of prevention is to use a spot-on preparation monthly on the back of your dog’s neck. We can advise you on lungworm prevention, diagnosis and treatment, please ask at the practice.